Depending on the ride you select, you will ride our well maintained fleet of 500cc Royal Enfield motorcycle or the 411cc Royal Enfield dual sport Himalayan in mint condition with the gearshift on the left and the brake pedal on the right (just like on modern motorcycles). 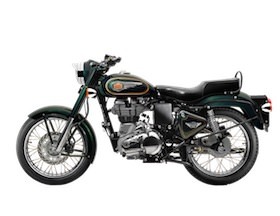 The motorcycles are upgraded by us to give you a trouble-free experience without taking away all the charm and fun of riding a Royal Enfields in India. The model of the motorcycles we provide for the tour is specified on each tour page. The single-cylinder, air-cooled engine has a long stroke, giving it a relaxed demeanor and oodles of torque, so you can enjoy the scenery as you thump along in top gear at a relaxed 30 mph. 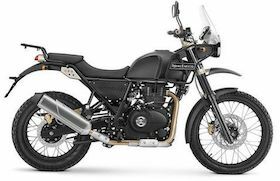 The disc brake in front (and in rear for the Himalayan) makes quick stops a breeze and the seats for the rider and pillion are wide and extremely comfortable. The upright riding position is especially designed to give maximum comfort on long rides and the pillion seat also has a comfortable backrest to lean back on. In case you are a couple, we will adjust the shock absorbers to give a smooth ride, taking the additional weight into account. For the Arunachal Pradesh and Pangi Valley tours, we will be providing you tents and sleeping mats (you will need to get your own sleeping bag). You will have a dome tent all to yourself. In case you are with a partner, we will provide you a larger tent. Trailing the pack will be the support vehicles along with the mechanics, the support vehicles will carry your luggage, water, spares and tools for the motorcycles. And most importantly, medicines, first aid kit and oxygen cylinder. On the Arunachal Pradesh and Pangi Valley tours, a separate support vehicle will be dedicated for the cook, his helpers, camping staff and the kitchen & food supplies.